For 17 & 18 please email owners directly gibbshalls@gmail.com for urgent sale! The Moose Valley Private Nature Reserve is arguably the most diverse of South Africa’s Klein Karoo private nature reserves . 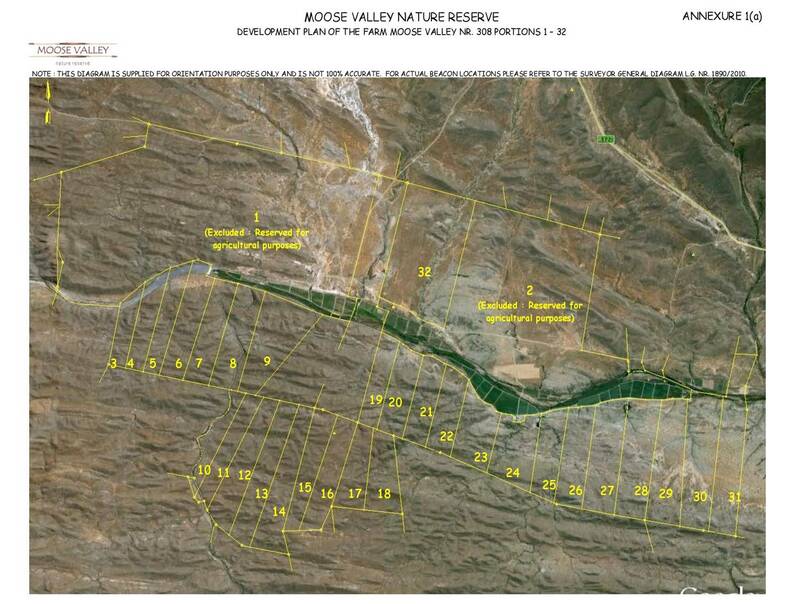 Moose Valley is approximately 7 000 Hectares and is made up of 30 individual farms ranging from 70 hectares to 200 hectares. The scenic valleys, mountains and Gwarrieveld are situated in an unspoilt landscape nestled between Towerkop, The Swartberg, The Langeberg and the Kamanassie Mountain ranges making for spectacular views. Breathtaking scenery - One of our main attractions is our unspoilt natural environment. We have majestic mountain views – the Langeberg in the southwest, the red koppies at Calitzdorp, the Swartberg with its well-known pass near Oudtshoorn and the Outeniqua. Unique vegetation - Moose Valley houses TWO of the most important biomes that were identified as world hot spots, namely,thicket and succulent Karoo. Each of these important biomes houses at least 1 500 endemic species (more than in the whole of Europe) and most of these plants are extraordinary, special and unusual. Atmosphere - Residents and visitors are also very appreciative of the atmosphere they find here, which is regarded as rural tranquility at its best. Nowhere else can one findtotal relaxation and inspiration.